We are from Estonia. It is a beautiful country near the Baltic sea. 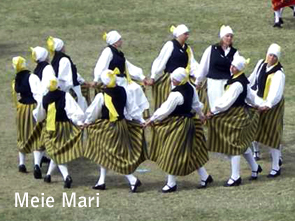 In our country the folk dance have an old traditions. In Estonia there are Dance parties (festivals) in every five year, when thousands of dancers from entire Estonia come together and dance. 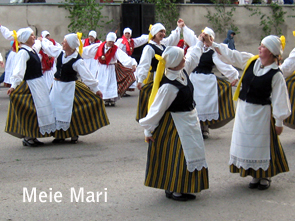 Our folk dance group called "Meie Mari" and we are from Jõgeva County and from village Laiuse. Our group is 16 years old and we dance quite well. Every year we have several performences and competitions. But we have not been yet in any big festival abroad. Now it will be a wonderful chance.